When assessing outdoor heat stress in public areas, air temperatures are only a part of the story. Other parameters like radiation load, humidity and wind speed also play a large role to define the thermal comfort of people.The effect of heat stress on a human body can be quantified by the Wet Bulb Globe Temperature (WBGT), an internationally recognized thermal comfort index. In the CORDEX.BE project, high-resolution climate maps for Brussels have been calculated. 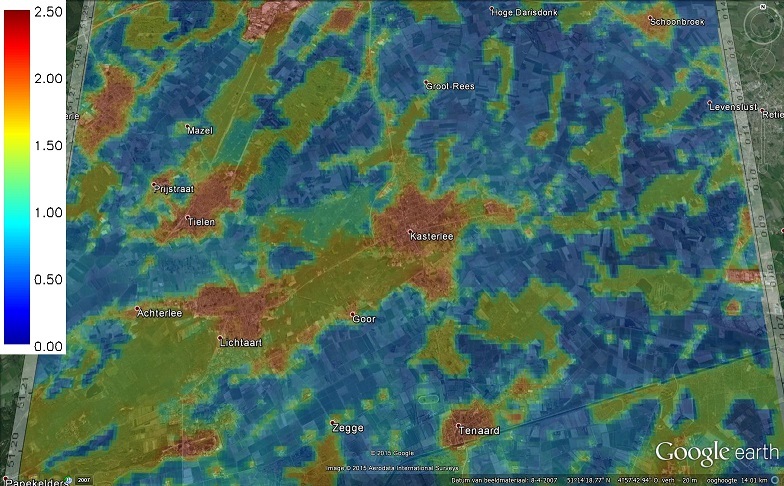 We developed a new downscaling technique, involving radiation calculations based on the 3D city model of Brussels, to calculate heat stress at a meter-scale spatial resolution, which drastically increases the relevance and usefulness of the data for policy makers. Moreover, since the WBGT index is also embedded in Belgian legislation regarding heat stress at work, it is possible to calculate potentially lost working hours for outdoor workers due to obligatory work breaks. In a next step, the ALARO EURO-CORDEX simulations (from Royal Meteorological Institute) were available to perform climate change simulations within the project. Since only one regional climate model and one global emission scenario (RCP8.5) were used, these results can be seen as a demonstration of the feasibility and added value of such a coupling but need to be interpreted with care due to the associated uncertainty. Simulations were performed for the reference period (1986-2005) and a future period (2081-2100). Based on the WBGT thresholds from the Belgian government for different types of work, we calculated the amount of obligatory work breaks for every type, expressed in the Lost Working Days indicator (see Table above). Clearly, climate change will have a significant impact on the outdoor productivity in the city of Brussels, as we see a huge raise in these numbers towards the end of the century. Note that these numbers are based on the results of only one model and one emission scenario, so they should be interpreted in this regard. The presented results provide futher evidence that we need to start adapting our cities to heat stress and climate change. Cooling the public space and the buildings of a city by implementing green and blue infrastructure, constructing green roofs, shade elements, etc. instead of using airco systems yields significant energy savings and makes a city more attractive. New infrastructures that are already adapted to the coming climate change will in the end lead to lower costs and higher efficiency. The advantage of these measures is that they are so-called ‘no-regret’ measures, they will always help to improve the quality of living and the attractiveness of a city. Within the European FP7 research project RAMSES, one of the objectives was to generate data on the economic cost of climate change impacts in cities. Using the Wet-Bulb Globe Temperature index, an office building was studied in detail. Starting from global climate model predictions, the urban climate model UrbClim delivered future climate outdoor conditions for the cities Antwerp, Bilbao and London. In a next step, the Energyplus model calculated indoor climate and energy use impacts. In particular buildings without active cooling will suffer from excessive heat stress. Other type of building assessments (hospitals, elderly houses, ...) are planned in the future. Although the results for this prototype building should not be generalized, the methodology is easily transferable and adaptable for different set-ups, including other cities, prototype buildings and adaptation measures. The results of the research have been published in the international journal Climate Change. The article (Open Access) can be read here. At the request of the Flemish Thinktank Climate Adaptation, the impact of heat stress on human confort has been mapped for the whole territory of the city of Ghent, including the harbor area. In our study, we have focused on outdoor conditions. Depending on the type of work (light work, medium heavy, heavy work and very heavy work), the potentially lost working hours could have reached 320 hours during the very hot summer of 2003. This quantitive geospatial analysis is based on the mapping of the wet bulb globe temperature (WBGT) indicator and the application of the Belgian law on labor time reduction due to heat stress. The WBGT indicator is an internationally accepted indicator integrating the effects of air temperature, humidity, wind speed and radiation effects on the human body. For the city of Ghent, the highest WBGT conditions are found in the harbor (open sealed areas without any vegetation) and in streets flanked by insolated building facades. The lowest values are found in the shadow of trees. From past research we know that greening reduces outdoor heat stress conditions. Large trees with closed crowns are most effective. Applying drastic greening scenario’s (minimum amount of large trees of the order of 10, 20 and 30%) significantly reduces the amount of potentially lost working hours. The summer of 2003 is taken in many studies as a reference summer for future climatic conditions with increased heat stress due to climate change. This Google Earth flyover shows the Mean Radiant Temperature (heat stress indicator) for a very hot day (air temperatures >40°C) in the city of Almada, Portugal. The values range from 30°C (dark blue) to 70°C (dark red). When the Mean Radiant Temperature is over 40°C (orange zones) people experience heat stress, when it is over 60°C (dark red zones) the situation is problematic (very high heat stress). The coolest locations are found in the forests, where shading and evaporation provide cooling, whereas the hottest locations are found in small street canyons without vegetation in the inner city, where the radiation is trapped. More information about the expertise developed is availabe here. At the Energy and Climate day organised by the Flemish Association of Towns and Villages (VVSG), Kasterlee was selected for a urban heat island map. Although Kasterlee only counts about 18000 inhabitants, a small but significant urban heat island effect is present at each of the 3 urban centres (Kasterlee, Tielen and Lichtaart). The urban heat island map will be used by the Kasterlee authorities and administrations in its ambition for a sustainable development. The urban heat island map provides graphical support about the spatial variability and can be used in the communication with citizens. It also provides objective evidence to motivate the implementation of climate adaptation measures to safeguard Kasterlee from negative climate change impacts. 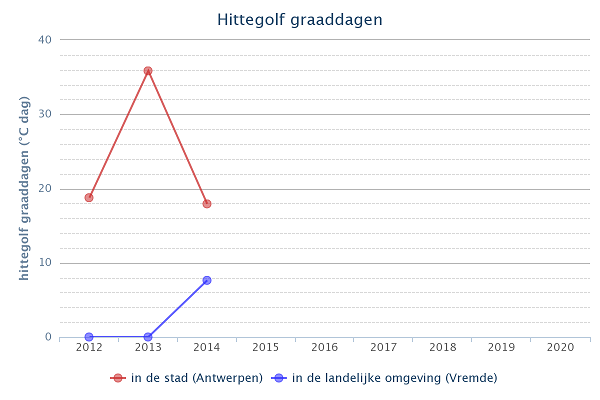 On Thursday September 17th 2015, the Flanders Environment Report team of the Flemish Environment Agency made public its new Climate Report 2015 on the observed and future climate For the Flanders Environment Report, VITO developed a new indicator to monitor the heat stress inside urban areas.changes in Flanders. VITO and the KU Leuven analysed the impact of climate change on the Flanders environment. 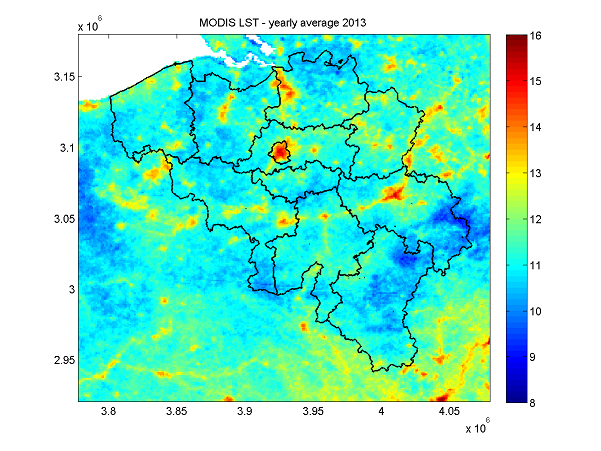 Bino Maiheu and Koen De Ridder from the VITO Urban Climate team analysed the urban heat island intensity in Flanders based on all available in-situ and satellite observations. VITO developed a new indicator “Heatwave degree days (in Dutch)” for urban heat stress monitoring that differentiates rural and urban areas. During heat waves, cities experience mortality rates that are 2 to 3 times higher compared to rural areas. Therefore, a heat stress indicator needs to take the urban heat island effect into account. The Flemish Environment Agency plans to update the indicator yearly. Within the RAMSES project, the UHI variability across Europe has been investigated. The 1st RAMSES Policy Brief reports on the UHI variability across Europe. On Friday 3th of July, an extremely hot day, VITO in collaboration with colleagues from the universities of Leuven and Ghent, performed a measurement campaign inside and outside Ghent to map the cooling effects of water surfaces. The measurement campaign concentrated on two areas: rivers nearby the inner city Sint-Pietersplein and inside the recreational domain Blaarmeersen which is located at the outskirts of Ghent. A reference urban measurement site was installed on the inner court yard of Wereld of Kina which is located at the Sint-Pietersplein. Air and water temperature measurements on the rivers nearby the Sint-Pietersplein took place on a motorboat. We also equipped 2 bikes in order to rapidly map the air temperature inside the streets nearby and further away from the river. At the Blaarmeersen, the VITO Aquadrone, an unmanned, mobile sensor platform, performed the temperature measurements. Also here, the measurement bikes were used to map the air temperature at the banks of the lake. All measurements used advanced temperature sensors, mounted inside dedicated actively ventilated casings, in order to get as accurate as possible data. GPS-data allows to locate the measurements spatially. The analysis of the data is planned for the coming weeks and will allow to determine quantitatively the cooling effect of water. We will share the results in a future news item. We gave a presentation in the session "Solutions for Adressing the Urban Heat Island Effect". The joint-presentation with Alterra focused on the assessment of the Urban Heat Island using measurements and modelling. The session description and the other presentations can be found here.